Ready for something different? How about a progressive experimental fusion jazz quartet? Not different enough? OK, what if the instrumentation were drums, bass, guitar, and mandolin? Still not convinced? Fine. What if the mandolinist also blows a mean clarinet and the guitarist doubles on bassoon? 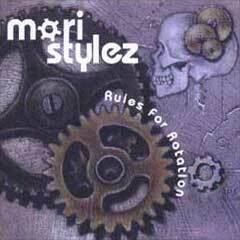 The band in question, Mori Stylez, was formed by four graduates of Connecticut’s Hartt School of Music, and recently released its full-length debut, Rules for Rotation. Dennis Lichtman is the mandolinist/clarinetist; his bandmates are Zed Kelley on electric guitar and bassoon; Andrew Schmidt on electric bass; and Barry Davis on drums. (Both Schmidt and Davis have left the band since Rules for Rotation was released.) Mori Stylez charges through nine tunes with a sound that ranges from melodic to thorny. The compositions and arrangements—eight originals plus a sensitive take on Charles Mingus’s “Reincarnation of a Lovebird”—are consistently complex and challenging. Lichtman warned me that Mori Stylez’ sound isn’t meant to showcase the mandolin, but nonetheless our little stringed friend is well represented in a supporting role. Lichtman’s acoustic axe makes a brief appearance on “Jackroller,” the CD’s opener, playing repeated chord-melody figures with some subtle variations in timing. The tune is a funky bass-driven number with some pyrotechnic bassoon and clarinet work and a fine solo by Schmidt. “Cheeba” kicks off with an ultra-fast Mandoblaster triplet figure that makes my fingers ache just listening to it. Then the guitar and bass jump in to produce three-part harmony! A later section features plenty of spaced-out picking from Kelley and Schmidt as well as Lichtman. There’s a fine, nearly Grismanesque Mandoblaster break on the Mingus piece, with lots of fast chromatic licks and a nice bit of crosspicking. Lichtman does a good job of building this solo across the instrument’s entire range. “Darcopus” and “Adventures of Dionysus” also feature intriguing solos by Lichtman. In fact, there’s a touch of mandolin on nearly every track, and even when there isn’t, these four gents are doing very interesting work. The mandolin/clarinet thing isn’t unique; Andy Statman does it, but then again I don’t think there’s a bassoonist in his band. If you like Henry Threadgill and other Knitting Factory–type jazz, Mori Stylez should be right up your alley. And if you’ve never checked out the genre, Rules for Rotation would be the perfect introduction.